Here's another song I thought of in conjunction with the él programme, and something to hurry the spring along. Before, Three Berry Icecream was just a band that had shared a split-7" with The Fairways to me. But now I've actually heard them! They're from Japan where the legacy of él records has always been more important than in Europe. (It might have something to do with Momus moving there in the 80's...) It was a big influence for the emergence of j-pop and the creation of artists like Kahimi Karie. 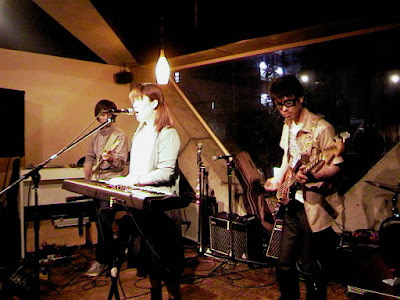 The band is essentially Mayumi Ikemizu, who was formerly in Bridge. This song is from a cdep called Apricot from 2000. There's also a song called "A Sunny Spring Day" on it, but this one has vocals too! HOW unfair! i want to see three berry icecream too! pout. well, i meant 'heard' as in 'heard on record'. the pic is just something i found with google. i'd love to see them too! you can download their cover of fairways' "klm line" here.